I know… yet another post about cosmetic surgery, but the thing is cosmetic surgery in Asia (especially South Korea, Thailand, Singapore, Malaysia and the Philippines) is pretty damn popular. However, this time I’m going to take a slightly different autoethnographic approach and tell you guys about a brief chat that I had with one of my South Korean friends about her first hand cultural experiences with cosmetic surgery. 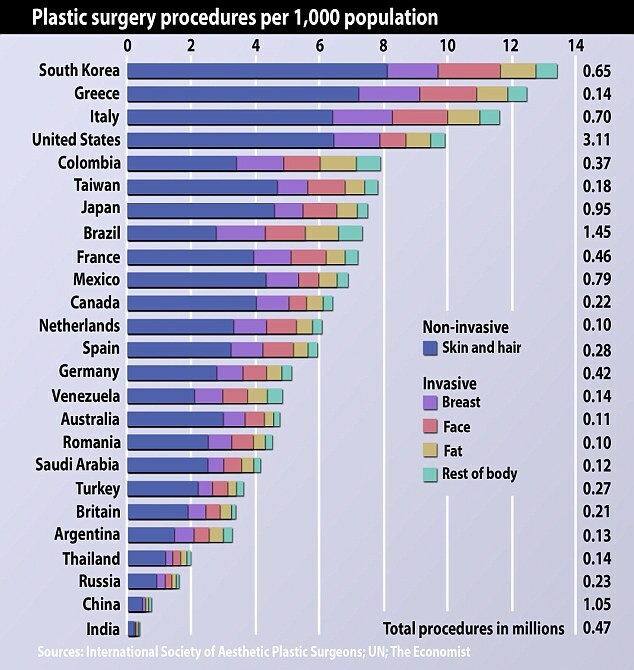 South Korea, is currently the leading country in number of cosmetic surgeries performed annually. The double eyelid surgery, also known as blepharoplasty, is the most popular procedure. This is where an extra fold of skin above the eye is created, and it is visible when the eyes are open. Only around 50 percent of the East Asian population is born with a natural “double lid.” Turns out that rhinoplasty is also one of the top cosmetic surgeries performed in general and in the continent of Asia with 1 in 5 South Korean women having plastic surgery done. According to my South Korean friend it has become somewhat traditional for teenage girls to expect some form of cosmetic surgery as their high school graduation gift, it was an equivalent to getting a car as a graduation gift which is what I am used to. Thus, many girls and students will come to their first days of university with a much different face to what the graduated high school with. My friends experience tells me that cosmetic surgery is common among teenage girls and it made me interested what the age group for such procedures seemed to be popular amongst. According to the International Society of Aesthetic Plastic Surgery (ISAPS) 20 per cent of women between the ages of 19 and 49 in Seoul have admitted to have had surgery. Apparently, many patients come in with photos of celebrities and ask for surgeries to make their features more alike. Idealizing popstars so much, wanting to look like them explains why pop stars were so heavily featured throughout Get it Beauty and Belo Beauty 101 as mentioned in previous post and reinforces the idea of a heavily embedded celebrity culture when it comes to self image in countries like the Philippines and South Korea.